Dubai, United Arab Emirates: As a pioneer of innovation in the imaging business, Canon Middle East will host the second edition of ‘Frontiers of Innovation Forum 2017’. The forum in partnership with MEED will be held on 28th September this year and aims to provide a platform for driving innovation, share ideas, gain insights, experiences and generate solutions. This year, the Frontiers of Innovation Forum will focus on important updates and discussions on the ‘Dubai Cyber Security Strategy’, ‘The role of digital transformation in the development of UAE’, ‘Entrepreneurs and SMEs and their role in unlocking innovation across the UAE’, ‘Role of Private sector in driving the innovation agenda of the UAE’ and ‘Interpretation of innovation in a Smart City environment’. Anurag Agrawal, Managing Director, Canon Middle East said: “Canon’s Frontiers of Innovation Forum acts as a conduit in bringing the government and businesses together with the objective of identifying opportunities on how to continuously innovate and contribute to the UAE’s Vision 2021 goals. Canon will continue to deliver the best possible offering for its customers and support the larger vision of the government through ongoing innovation”. “We again thank MEED to have partnered with us as we continue to strive to find innovative solutions to build smart cities.” he further added. The Frontiers of Innovation Forum 2016 findings focused on Big Data and the Internet of Things combined with the latest technology and developments affecting all aspects of our lives, bringing about efficiencies and change. “As the UAE plays an increasingly important role in the global economy it is imperative that it remains efficient and competitive on the world stage. 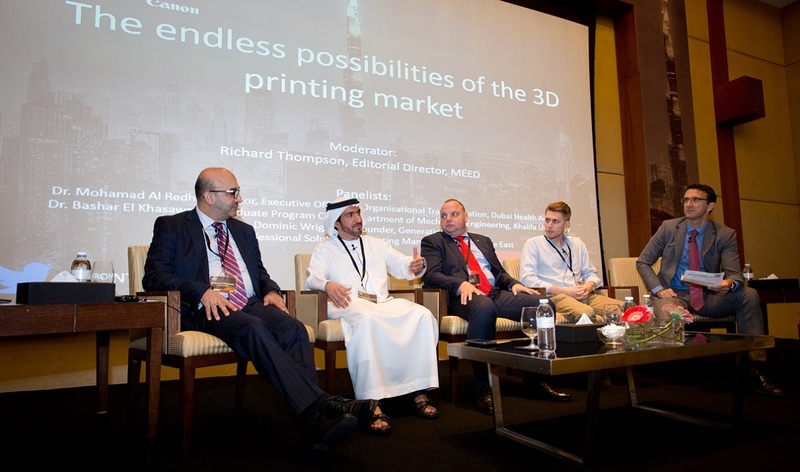 Engaging with the private sector to promote innovation and develop new technologies is key to maintaining this edge, while at the same time helping expand new sectors that create white collar employment opportunities.”, comments Richard Thompson, Editorial Director, MEED. The UAE government has put the development of a culture of innovation at the heart of its Vision 2021 strategy as it seeks to develop the country as a knowledge hub and create happier, healthier and more efficient cities that meet the aspirations of future generations. As a global pioneer of innovation in the imaging business, Canon is perfectly positioned to make an important contribution to the success of the UAE’s vision. Canon invests heavily in R&D to deliver the richest and most innovative products and services to satisfy customers’ creative needs. From amateur photographers to professional print companies, Canon enables each customer to realize their own passion for image. MEED is a remarkable senior management media brand, that encompasses subscription to the MEED Business Review publication and website, meed.com As well as organising the MEED Quality Awards for Projects, AHIC and Innovation Live! MEED also works with clients on bespoke content, events, broadcast and digital offerings. MEED also has two high-value content businesses, MEED Projects and MEED Insight. MEED Projects is the Middle East’s premium project tracking database and MEED Insight offers tailored research and in-depth analysis. Established in 1957, MEED, has been integral to delivering business information and news, intelligence and analysis on the Middle East economies and activities ever since. From small beginnings in a London flat on 8 March 1957, MEED has grown with the region, sharing the ups and downs, and always exploring and taking on new challenges.